Slowly but surely, Makati has climbed to the No. 2 spot of the northern division of the MPBL Datu Cup after the Super Crunch brought down Navotas, 96-87, late Wednesday night at the Navotas Sports Complex. Six players ended up in double figures for the Super Crunch, who shot a steady 51-percent from the field (41-of-81) in beating the Clutch right at their own turf. Jeckster Apinan, a former player of the NLEX Road Warriors, finished with a double-double of 20 points and 13 rebounds. But Apinan, an undersized forward, also got plenty of help from his teammates. Ex-pro Joseph Sedurifa contributed 15 markers, the same output produced by Cedric Ablaza, while John Rey Villanueva added 13, Rudy Lingganay chipped in 11 and Mark Isip had 10 in a display of firepower by Makati, which now moved up to second spot at 18-4 card. Following its latest win, Makati and Manila sport the same win-loss record, but by virtue of the win over the other rule, the Super Crunch will move up to second spot in the tough northern division put up by Senator Manny Pacquiao with PBA legend and former MVP Kenneth Duremdes serving as commissioner. Defense has always been the calling card of Makati, which held Navotas to just 38-percent shooting from the field (30-of-79). The Super Crunch grounded the Clutch’s big guns, most notably, Jai Reyes, who was held down to just seven markers. Earlier, Quezon City repulsed a depleted yet hard-fighting Basilan squad in posting a 74-68 triumph. John Tayongtong led the way with 18 markers to lead the Black Mamba-backed Capitals back in the .500 win-loss mark. Quezon City improved its record to 10-10 and formally assumed the sixth spot of the northern division. COURTESY CALL. 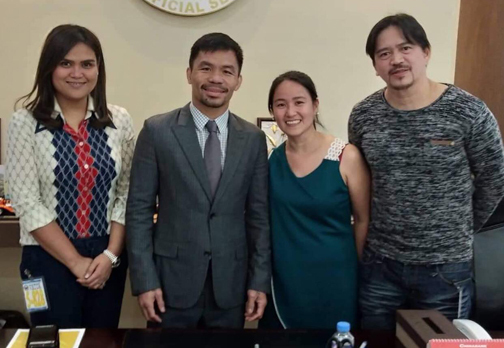 Davao Occidental Cocolife Tigers’ team owner Claudine Bautista (left) and deputy team manager Ray Alao paid a visit to Maharlika Pilipinas Basketball League top brass Senator Manny Pacquiao in his Senate Office recently. The South division MPBL Datu Cup front-running Tigers are backed by Cocolife President Elmo Nobleza, FVP Joseph Ronquillo and AVP Rowena Asnan. Following Navotas’ latest loss, the Clutch dropped to seventh place with a 10-12 record.